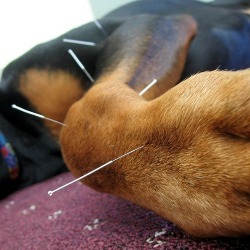 Most dogs and cats tolerate acupuncture quite well and will often go to sleep once the needles have been placed. Occasionally an animal will react to the needle placement but it is rare for an animal to be completely intolerant of acupuncture needles. When animals are in chronic pain, animals may require weekly or bi-weekly visits through four to six treatments. Follow up visits are scheduled based on the response to the initial treatment. For acute problems like diarrhea or vomiting, a single treatment coupled with an herbal prescription may resolve the situation. 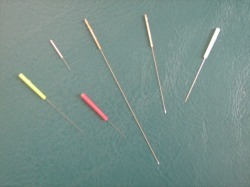 Needles come in a variety of widths, lengths and materials. They are placed in specific locations on the legs/feet, trunk and head which correlate with desired results. A single needle can many different effects. It may help relax a muscle, reduce pain, stimulate digestion, reduce fever, stop itching and strengthen the immune system. Red and white blood cell activity may also be impacted by specific acupuncture points. Needles usually remain in place for 15 to 30 minutes.